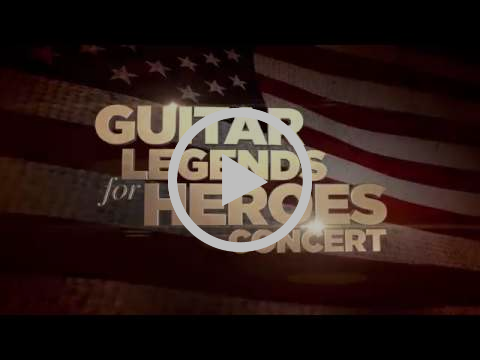 America Salutes You and Wall Street Rocks have joined forces for an unforgettable benefit concert AMERICA SALUTES YOU AND WALL STREET ROCKS PRESENTS: GUITAR LEGENDS FOR HEROES CONCERT. The unforgettable night is dedicated to our heroes to create national recognition as a “thank you” to our military, veterans and their loved ones, and will raise funds for the high impact charities that support them. The all-star event, co-hosted by Trace Adkins and Eddie Trunk, features special performances from Sam Moore (Sam and Dave), Richie Sambora (Bon Jovi) and Orianthi, Dave Navarro (Jane’s Addiction), Billy Gibbons (ZZ Top), Joe Don Rooney (Rascal Flatts), Nancy Wilson (Heart) and Liv Warfield, Lindsay Ell and Robert Randolph, will air nationally on Tribune Broadcasting, Sinclair Broadcast Group, Hearst Television, Graham Media Group, Gray and Ion television stations on December 23rd. Check your local listings for times. After 16 years of war, the number of veterans including the National Guard and Reservists, with multiple tours of combat duty, is the largest in modern American history. Today, many of those who have served are unemployed, homeless, uninsured and struggling to provide for their families. Now more than ever, veterans and their families need our service. The Elizabeth Dole Foundation, Hope For The Warriors and Warrior Canine Connection, all made possible by presentation sponsor The Independence Fund and other corporate sponsors including American Airlines, Johnson & Johnson, Walgreens, The National Football League, Broadridge and TIBCO, with text-to-donate provided by AT&T. The Legendary Soul Man™ Sam Moore recently released his latest album. Sam Moore: An American Patriot, available for purchase including downloads on iTunes, Amazon, and more. The album was inspired by Moore’s performance of “America the Beautiful” on the steps of the Lincoln Memorial, where his dear friend and inspiration Dr. Martin Luther King, Jr. stood 53 years earlier and delivered his famous “Dream” speech. Moore believes that music is the universal language that knows no boundary or color and was the best way for him to take a stand and make an impact in helping to bring the country he loves back together. Sam Moore found musical fame as one half of the ’60s powerhouse duo Sam & Dave. With 1967’s hit “Soul Man,” the duo found lasting fame, defined a genre, and altered the course of music history. Their signature sound influenced a diverse array of musical talents, including Al Green, Michael Jackson, Lionel Richie, Tom Petty, Phil Collins, Elvis Costello, Billy Joel and so many others. Sam & Dave’s music and personas inspired the film The Blues Brothers, and other hits like “Hold On I’m Coming” have appeared on the soundtracks of more than a dozen films. Moore, 81, continues to record and perform to critical acclaim as a solo artist and as a guest performer for dozens of his musical friends. The Legendary Soul Man recently accepted a position as Artist in Residence at Florida International University as part of the College of Arts, Sciences & Education Humanities Project. America Salutes You is a 501c3 organization created to express our national gratitude to our troops, our veterans and their families through an annual nationally broadcasted benefit concert that will raise funds for a range of high impact veteran charities. Wall Street Rocks is a 501c3 organization that creates both televised and festival like music events designed to bring people together to raise awareness and most importantly raise money for the outstanding veteran and military charities that help our military, veterans and their families. We are a unique collaboration of employees across the financial, technology and entertainment industry focused on supporting heroic Americans who serve our nation. From brave soldiers deployed around the world who protect our freedoms, to first responders who selflessly venture into dangerous emergency situations here at home, these courageous men and women have our backs every day. Wall Street Rocks has their backs. For more information and to make a donation, please go to www.musicforheroesconcert.org. All Content © 2018 Sam Moore.